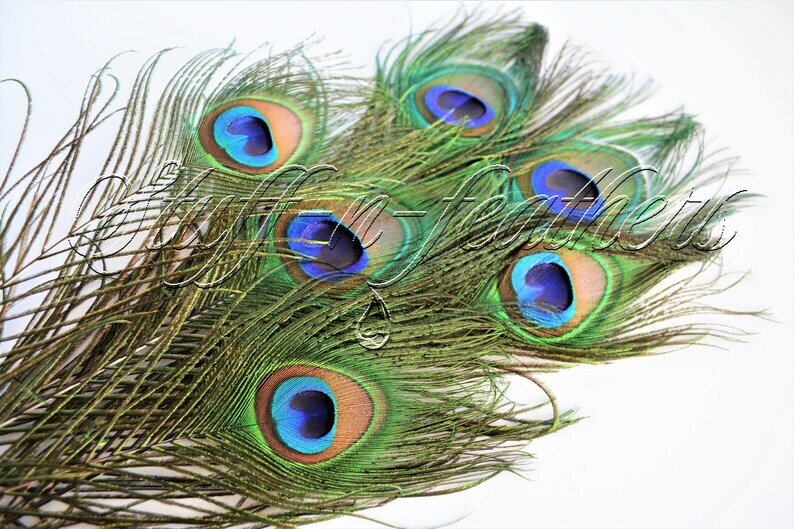 This is a listing for premium hand selected natural real long peacock feathers. These feathers have gorgeous natural colors and iridescent shine. The feathers you will receive will have different size eyes. Peacock feathers can be used for a variety of craft projects, home décor, bouquets, floral arrangements, jewelry making, hair accessories, masks, millinery, fishing and much more. Let their beauty lead your imagination… this size in particular is very suitable for invitations, hair accessories and jewelry. All our peacock feathers are naturally shed by the birds. All feathers are clean and ready to be used. They come from smoke-free studio. They can be washed, styled, cut and completely transformed to fit your individual needs. International orders are shipped First-Class Mail International. Delivery time depends on the location. IF YOU RESIDE OUTSIDE OF THE USA, YOU ARE RESPONSIBLE FOR KNOWING YOUR COUNTRY'S IMPORT LAWS AND ARE RESPONSIBLE FOR ANY ASSOCIATED DUTIES OR TAXES DUE AS A RESULT OF YOUR PURCHASE. ANY CUSTOM FEES OR DUTY TAXES ARE THE RESPONSIBILITY OF THE BUYER; AND, AS SUCH, THE AFOREMENTIONED FEES AND TAXES WILL NOT BE REFUNDED OR REIMBURSED BY THE SELLER. IN RARE CIRCUMSTANCES, CUSTOMS OR IMMIGRATION DO SEIZE ITEMS AND/OR MAY CAUSE A LONG DELAY IN DELIVERY. Beautiful feathers! They arrived fast! beautiful peacock feathers very carefully packaged. great seller. They arrived on time and packed well. And they’re beautiful. Love these, they are so beautiful! I purchased them to display them in my living room. Great packaging and fast shipping. Payment is due when items from the shop are selected and checkout is completed. Please be prepared to promptly closeout your transaction. Be aware that the items you have selected may become available to other shoppers after a period of time. You may pay for your order with your credit/debit card or via PayPal. 1. Buyer must contact us about the return within 72 hours of receiving the order. Not authorized returns will not be accepted. 2. Order must be shipped back (postmarked) within 7 business days of receipt. Items should be in the original condition. 3. Return shipping is at customer’s own expense. ALL CUSTOM ORDERS SALES ARE FINAL AND NOT REFUNDABLE. ANY CHANGE MADE TO THE EXISTING LISTING PER CUSTOMER REQUEST IS CONSIDERED A CUSTOM ORDER. Order cancellation is allowed within 24 hours of purchase without charge, after 24 hours – subject to 10% cancellation fee. No exceptions. 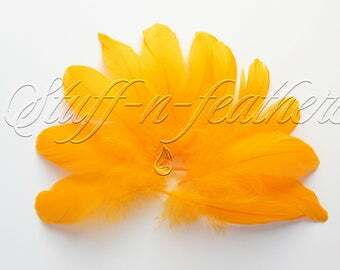 3-7 BUSINESS DAYS of receiving payment - bulk/wholesale hand painted feathers. EXCLUSIONS APPLY. Please check the SHOP ANNOUNCEMENT located under the shop banner for any changes in processing time. * Processing time information (“ready to ship in”...) located at the top of the “Shipping & Policies” section of every listing. 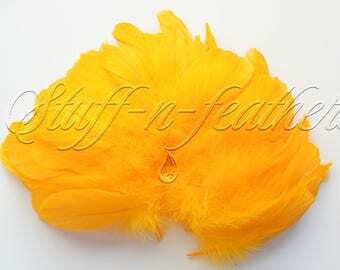 For large wholesale and hand painted feathers orders processing time vary. Please contact for more information. For Custom orders processing time see “Additional Information” section of the Policies. First Class, Priority and Express Mail shipping is available. PRIORITY AND EXPRESS MAIL DOES NOT MEAN EXPRESS PROCESSING TIME! All orders are shipped in the order they have been received. If you need your order by certain date contact us BEFORE placing your order to see if it’s possible. Undeliverable / returned domestic or international orders due to wrong address, change of address, refusal, refusal to pay custom/import fees or any other similar reason will be charged 20% restocking fee. Orders are shipped via USPS First Class Mail (Standard Mail for large orders that do not qualify for First Class). Tracking number will be provided after the item is shipped and the customer can easily track the order online. Delivery time depends on the location: 2-7 days after the item is shipped!!! EXPRESS MAIL (1-3 days, depends on location) IS AVAILABLE - for an additional payment of $25.00 (feathers up to 12") / $35.00 (feathers 12"+, including 10-14") - This is a guaranteed service. Some items due to size and/or length are not qualify for Express Mail. Contact us for further information and provide the list of desired items. Due to restrictions on shipping feathers to many countries PLEASE MAKE SURE THEY ARE ALLOWED TO BE SHIPPED INTO YOUR COUNTRY BEFORE PLACING AN ORDER. Orders are shipped First-Class Mail International. Delivery time depends on the location. PRIORITY and EXPRESS MAIL INTERNATIONAL IS AVAILABLE. Shipping charges vary by destination. Please contact us for an estimate. If you reside outside of the USA, you are responsible for knowing your country's import laws and are responsible for any associated duties or taxes due as a result of your purchase. PLEASE CONTACT YOUR LOCAL CUSTOMS OFFICE FOR MORE INFORMATION AND ESTIMATED FEES BEFORE PLACING AN ORDER. Full value of the sold merchandise will be declared on the Customs Form without exceptions. ANY CUSTOM FEES OR DUTY TAXES ARE THE RESPONSIBILITY OF THE BUYER; AND, AS SUCH, WILL NOT BE REFUNDED OR REIMBURSED BY THE SELLER. In rare circumstances, customs or immigration do seize items and/or may cause a long delay in delivery. Please note, tracking number will be provided after the item is shipped but only for the purposes of proof of shipping. You will only be able to tack the item up until it leaves US territory. After that we are not responsible for your order and delivery which is in the hands of your countries customs and postal services. Please contact us via Etsy CONVOS with any questions. Allow 24-48 BUSINESS HOURS for response. Custom orders are accepted on case by case basis. Fees may apply. In-stock items - 1-7 business days, depending on the items. Non-stock items – 7-10 business days. ANY CHANGE MADE TO THE EXISTING LISTING PER CUSTOMER REQUEST IS CONSIDERED A CUSTOM ORDER. ALL CUSTOM ORDERS SALES ARE FINAL AND NOT REFUNDABLE. By placing an order in our store you are agreeing to these terms and conditions.